Our book club definitely is a little more health conscious, but I know we all secretly hope the host has prepared something sweet to balance the saltiness of some of our heated discussions. I’m not much of a baker, (my sister and I once made chocolate chip cookies and forgot to add the flour), but I had some chocolate morsels in my refrigerator I needed to use. I was hosting book club that night and wanted to make a sweet treat to go with some hummus and naan I had already prepared. Cookies weren’t happening, and as I pondered what to do with the chocolate, I spotted a fresh packet of beautiful, red strawberries on my counter! Bingo! I now present my easy, cheat method for making delicious, mouth-watering chocolate covered strawberries…prepare to be amazed at my cooking prowess. 1. Place 1 cup of chocolate morsels in a microwave safe container (I like to use a glass measuring cup) and melt the chocolate morsels in the microwave for 30 sec on high power. 2. Remove from the microwave and stir the melty, morsely mixture. 3. Place back in the microwave and melt for another 30 sec on high power. 4. Remove from the microwave, and stir briskly until all of the chocolate has melted. (You might need to put it back in the microwave for a few more seconds). 5. Gently dip the strawberries into the mixture, turning them to coat all sides. 6. 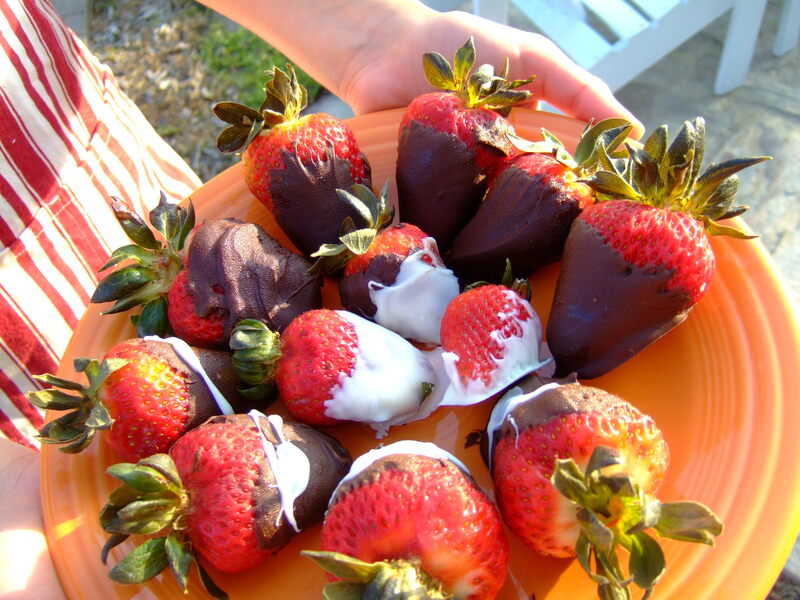 Place the dipped strawberries on waxed paper on a baking sheet and let them cool. If you want them to harden quicker, place them in the refrigerator. 6. After you’ve finished dipping all of the strawberries, heat the vanilla candy melts. 7. Using a spoon, drizzle the melted vanilla candy melts over the strawberries in a striped pattern. *Be careful to heat the chocolate in stages, removing it from the microwave to stir it. It is easy to scorch it if you heat it too long. You definitely don’t want to heat it for over a minute without stirring it. *You need to have all of the materials ready to go because when you remove the melted morsels from the microwave the chocolate will harden quickly. You need to dip the strawberries before this happens. This entry was posted in 5 ingredients or less, Angry Housewives Eating Bon Bons, Book Club Snacks and Appetizers, Desserts, Easy preparation, summer desserts, Uncategorized and tagged chocolate covered strawberrey recipe, easy chocolate covered strawberries, how to make chocolate covered strawberries, recipe. Bookmark the permalink. 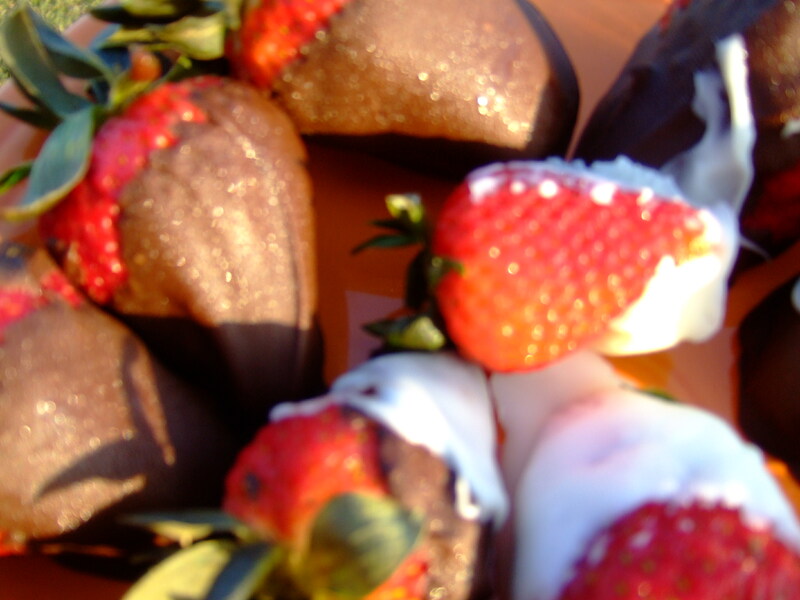 1 Response to How to Make Easy Chocolate Covered Strawberries: A Book Club Treat! Hopefully your naan recipe will show up in the future…that was insanely delicious!